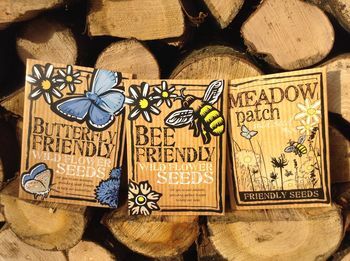 Beautiful gift package of 3 packs of high-quality bee, butterfly and meadow friendly seeds for flowers rich in nectar and pollen to help wildlife. Trio gift pack of beautifully designed and very high quality packets of specially selected wild flower seeds that bees and butterflies will love. The seeds produce a delightful selection of wild flowers. Whether you live in the country or the city you can sow these seeds in gardens, window boxes or any open spaces. By doing this you'll be directly helping to save wildlife by providing plants rich in pollen and nectar. All our seeds are free from pesticides and insecticides. Part of proceeds donated to bee and conservation organisations. 100% British wild flowering mixture. See also our other products, including seed packets for Valentine's Day, Mother's Day etc. and customisable packets for wedding favours, or any other occasion. High-quality design card packets, containing three sachets of seeds, plus a printed insert with seed/ flower descriptions and sowing instructions. This product is dispatched to you by Bee Friendly Seeds.